Adrian Shelley, director of Public Citizen’s Texas Office, spoke out against SB 1021 and HB 2269 in Austin today. Photos courtesy of Public Citizen. Nuclear waste opponents are sounding the alarm about bills they say could allow more low-level nuclear waste being imported into Texas and lead to OKing a high-level nuclear waste dump in the state. 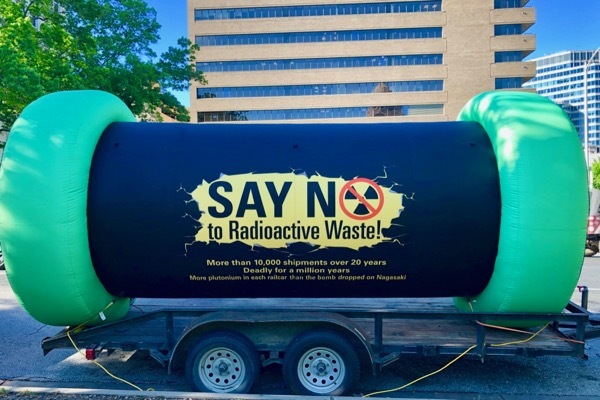 On Tuesday morning, members of Sustainable Energy and Economic Development Coalition and Public Citizen Texas, flanked by a large model of a waste transport cask, urged the legislature to reject SB 1021 and HB 2269 and approve a ban on high-level nuclear waste in Texas. Backing the two bills is Waste Control Specialists, which has operated a radioactive waste storage facility in Andrews, Texas since 2012. According to Adrian Shelley, director of Public Citizen’s Texas Office, WCS is seeking permission to build an additional waste pit for low-level nuclear waste. In addition, it’s seeking to eliminate the 5 percent fee it pays to the state. The company said it is perpetually losing money and needs the concessions to continue to operate. SB 1021 by Sen. Kel Seliger and HB 2269 by Rep. Brooks Landgraf are pending in the legislature and are expected to go to the House and Senate floors this week. Meanwhile, WCS has an application pending with the federal Nuclear Regulatory Commission to import high-level nuclear waste into Texas, likely fuel rods from the core of nuclear reactors. If the bills pass, Shelley expects the company to use the victory to make the case for expansion of its facility. “It would further the narrative that Texas wants high-level nuclear waste,” said Shelley. However, Shelley expects to be able to rally bipartisan support on a ban of high-level radioactive waste, including from the authors of the bills. The coalition is seeking to add an amendment to the bills banning high-level nuclear waste in the state. Shelleys points out that high-level waste is a concern for all Texans. While exposure to lesser amounts of radiation can lead to cancers, genetic damage and birth defects, exposure to un-shielded spent fuel rods is lethal, he said. Also, the high-level waste would likely travel through most major cities along rail lines parallel to Interstates 10, 20 and 30, and along I-35 from Oklahoma City to Fort Worth through Midland-Odessa on its way to the site. According to Karen Hadden, director of the Sustainable Energy and Economic Development Coalition, high-level radioactive waste should only be moved once, when it can go to a permanent disposal facility deep underground to keep it isolated for a million years. Shelley urged Texans to call their legislators and ask them to reject SB 1021 and HB 2269 and support a ban on high-level nuclear waste in Texas. You can tell your Texas Representative and Senator to oppose these radioactive bills via Public Citizen's web letter.